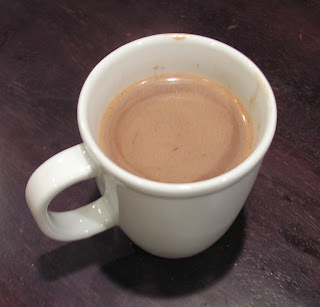 I used to think of hot chocolate as something that I really, really looked forward to when I was backpacking. Of course, the thing about backpacking is, when you get home, you realize that all those special backpacking treats - the 5-day-old gouda on stale pita, the 151-proof rum mixed with tang served in an unwashed mug that recently held coffee and lasagna, and yes, the hot chocolate served over the remnants of last night's mashed potatoes - just don't seem as delicious when you return to civilization. They all go straight into the trash, to be bought again in 358 days. Hot cocoa was a backpacking delight, and perhaps as a result, it had no place in my normal life. That was until Mia made us homemade hot cocoa recently. Mia and I were enjoying ourselves, sitting at the table with my friend Josh and his girlfriend Andrea. When Mia suggested homemade hot chocolate with amaretto as a dessert drink, I readily agreed, but I didn't think about it too carefully. Josh and I continued our self-indulgent discussion about the secret lives of famous economists while Mia tended to the stove just beyond my field of vision. She soon placed the mug in front of me, but not until I put it to my lips did I recognize, finally, the enormousness of the moment. Homemade hot cocoa is to Swiss Miss as raw milk cheese illegally imported from France is to Cheese Wiz, as 1982 Chateau Margot is to Thunderbird. The only remotely comparable experience was when, in high school, my Venezuelan friend Adrienne gave me a cup of her mother's homemade hot cocoa. That particular cocoa tasted like a melted bar of chocolate - it was incredibly flavorful, rich and thick. But it turns out it was missing something - a secret ingredient or two. Mia made the cocoa in two ways - a more traditional version with cocoa powder, and one inspired by the South American tradition known in Argentina as submarino, which is milk served hot with a chocolate bar. Both drinks begin with heating skim milk. Then you add the chocolate, either in the form of powder or a bar. Finally, you flavor it with cinnamon and vanilla. Feel free to omit these secret ingredients for the "classic" hot cocoa experience, but we think that you'll find that vanilla and cinnamon elevate hot cocoa to new highs. Heat milk over medium heat in a small saucepan. Add cocoa and sugar, stir or whisk to remove lumps and combine. 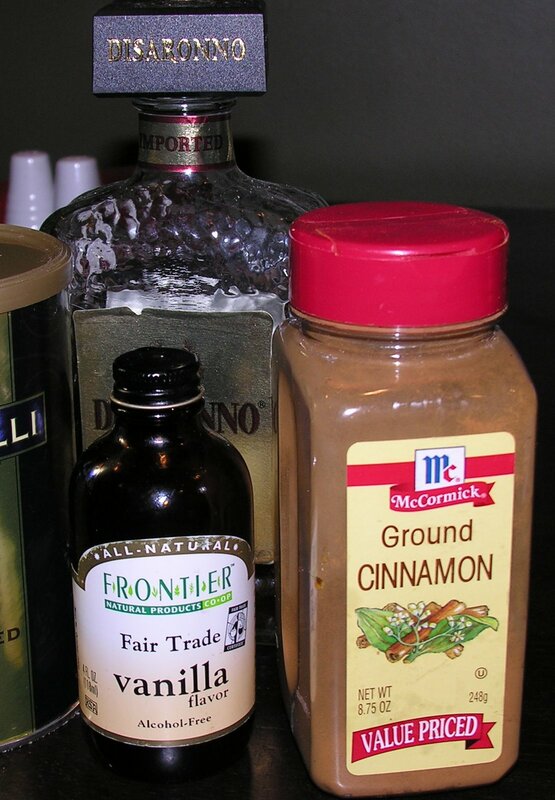 Add cinnamon and vanilla. Continue stirring until hot. Pour into mug and top off with amaretto. Serves 1 and leaves others jealous. *Note: For submarino-style hot chocolate, substitute about an ounce of bittersweet chocolate for the cocoa powder and add sugar to taste. If you think that's good, you should come to Naked Chocolate in Philly. That is what my Penn Appetit article is about, actually - their drinking chocolate (in this case, "drinking" is an adjective). Drinking chocolate is basically melted chocolate (milk chocolate and dark chocolate), cocoa, and sugar. Then, you can add whatever spices you want. At Naked there is a variety called Azteca which has cinnamon, cardamom, nutmeg, and cloves. So, it's not really hot chocolate...it's a whole different species. And you can't drink much of it without, as Mia mentioned in her Thanksgiving post, wanting to barf. Gators, Pythons, and Bears Oh My!